Lac de Maury in France is very popular with anglers because of the beautiful surroundings and great carp fishing. With a size of approximately 170 hectare Lac de Maury is one of the larger public waters in the area in south central France. Nearby is the huge Lac de Sarrans . 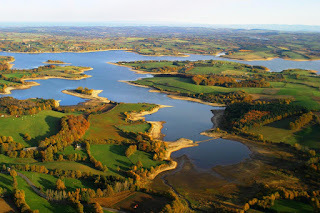 Lac de Maury is located in the beautiful Aveyron area in France. This reservoir was created in 1947 and is one of the many large public waters in the region, which is characterized by its green surroundings and hilly landscapes. Lac de Maury is located relatively high at 588 meters altitude. The Lac de Maury is especially popular with French anglers, partly because of the flexible regulations, mainly for night fishing. The average depth of the lake Maury is between 20 and 30 meters, with a large variety of different places. The deepest parts are of course entitled to the dam and in some nearby branches, where 50 meters to the bottom is not uncommon. Lac de Maury is certainly no easy water, but contains some very nice carp with some big fish of more than 30 kilos. The average catch weight is 8-10 kg, with a particularly large number of mirror carp. About a week fishing will most likely result in captures of at least 15 kilos, with many reported catches of just over 20 kilos. The exact record weight for carp is unknown, but French carp magazines have reported about multiple fish of more than 30 kg. Night fishing is allowed, as is the use of a (bait) boat, which can be put into the lake in several designated places. For more information about the local fishing rules its probably best to look on the website of the local fishing federation, in this case the Fédération de pêche d'Aveyron . Near Lac de Maury are several other awesome public waters (see also by clicking on the map of France (In Dutch) on the image above). Consider the northerly Lac Sarrans or located in western waters Saint-Étienne-Cantalès and of course the River Lot . To stimulate tourism has made the region several promotional films in order to attract more anglers. 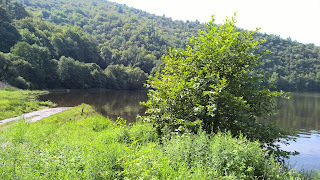 The following Youtube video, where Lac de Maury passes, gives a good picture of carp fishing in the Aveyron region.